August 2017 • The PCB Magazine 95 Ventec Seeking U.S. Product Manager for tec-speed Want to work for a globally successful and grow- ing company and help drive that success? As a U.S.- based member of the product and sales team, your focus will be on Ventec's signal integrity materials, tec-speed, one of the most comprehensive range of products in high-speed/low-loss PCB material tech- nology for high reliability and high-speed com- puting and storage applications. Combining your strong technical PCB manufacturing and design knowledge with commercial acumen, you will of- fer North American customers (OEMs, buyers, de- signers, reliability engineers and the people that li- aise directly with the PCB manufacturers) advice and solutions for optimum performance, quality and cost. Skills and abilities required: • Technical background in PCB manufacturing/ design • Solid understanding of signal integrity solutions • Direct sales knowledge and skills • Excellent oral and written communication skills in English • Experience in making compelling presentations to small and large audiences • Proven relationship building skills with partners and virtual teams This is a fantastic opportunity to become part of a leading brand and team, with excellent benefits. Please forward your resume to jpattie@ventec-usa.com and mention "U.S. Sales Manager—tec-speed" in the subject line. 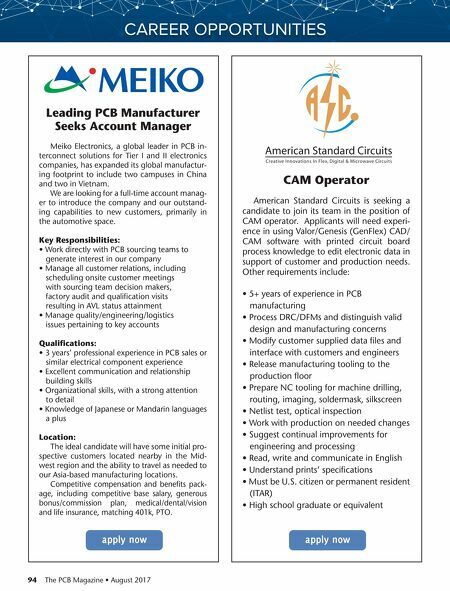 www.venteclaminates.com Experienced PCB/ Assembly Professionals Needed Find a rewarding career and become a suc- cessful leader with Zentech Manufacturing. 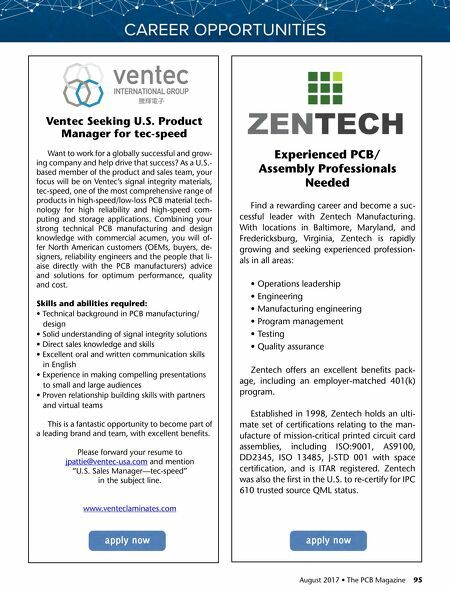 With locations in Baltimore, Maryland, and Fredericksburg, Virginia, Zentech is rapidly growing and seeking experienced profession- als in all areas: • Operations leadership • Engineering • Manufacturing engineering • Program management • Testing • Quality assurance Zentech offers an excellent benefits pack- age, including an employer-matched 401(k) program. Established in 1998, Zentech holds an ulti- mate set of certifications relating to the man- ufacture of mission-critical printed circuit card assemblies, including ISO:9001, AS9100, DD2345, ISO 13485, J-STD 001 with space certification, and is ITAR registered. Zentech was also the first in the U.S. to re-certify for IPC 610 trusted source QML status.